Habitat: Play Loft | Habitat | Kids VT - small people, big ideas! The story of Reagan Wentz's play loft begins, as many good stories do, once upon a time. When Reagan's mother, Lauren, was a little girl, she dreamed of having a slide in her basement or a climbing wall or roller blading rink, but her wishes never came true. Still, young Lauren got to climb at a gym and at camp, and she raced down mountains on skis. She grew up, got married and had a little girl of her own. 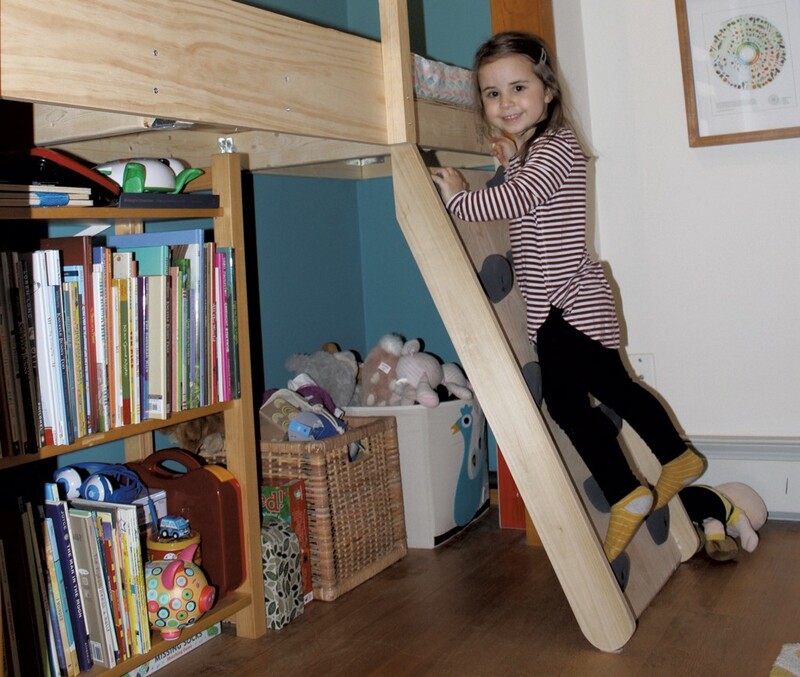 She and her husband, Michael, decided to make their daughter's bedroom fun and adventurous. They eyed her closet and thought two things. One, what does a 4-year-old need a closet for? Her tiny clothes fit in her dresser. And, two, those are some ugly doors. They were, Lauren said, "classic late 1960s hollow-core sliding doors." So Michael took them off, and the couple transformed the closet into a loft. They scoured the internet for how-tos, hit Home Depot for lumber and hardware and dove in. Reagan, who turns 5 in December, slid the stud finder over the walls and helped measure, mark and paint. She picked the color. It's her favorite, and it was one of her first words: blue. The family built and installed the platform in one day. Two-by-fours screwed into walls around the perimeter of the closet form the frame. Two crosspieces support the decking, and all corners are reinforced with metal brackets. Artist friend Daniel Mather designed and built the climbing wall ladder, a plywood board with a birch veneer wall that has poplar handrails. Michael and Lauren attached the climbing holds. They bought an upholstery cushion online and cut it to fit the loft platform. Mather's wife, fiber artist Katherine Guttman, gave them invaluable tips for that: Use an electric knife, cut it outside and wear eye protection, because the dust flies. Also, if you want a slipcover that won't stick to the foam when you take it off for laundering, put muslin or another inexpensive fabric over the foam first. Start to finish, the loft took about four days to build, but the work stretched over five months due to jobs and family life. The couple started in May, when Lauren was six months pregnant. Their son, Sage, was born in August. The loft railing was the last piece to go up. 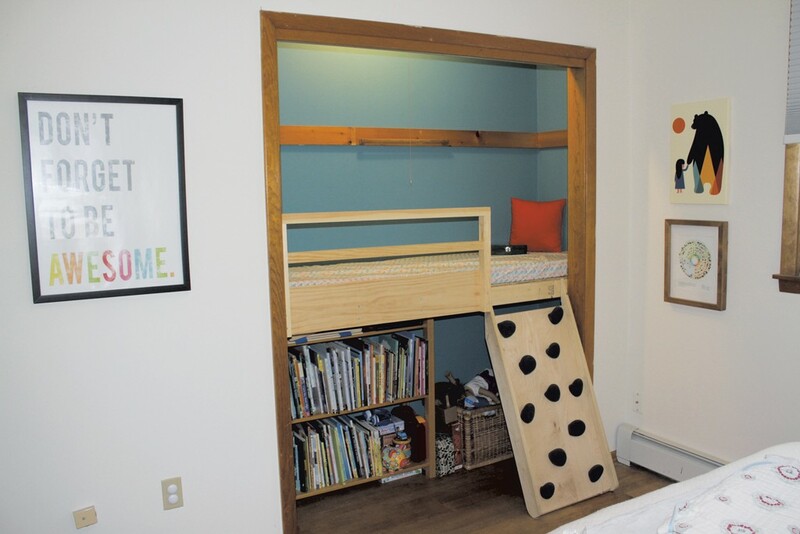 Lauren liked the sleek ones she saw on bunk beds constructed by Young House Love bloggers John and Sherry Petersik. "So the design of the railing, I totally pilfered from them," she said. It has pocket screws on the back and a double rail, which will help ensure that Sage won't slip under once he's old enough to join his big sister on the loft. Tucked under the platform are a bookcase, costumes, games and toys. Instead of storage, the space could easily accommodate a rod to hang clothes. Michael plans to install a shelf or magazine rack at one end of the loft for his book-loving daughter, who thinks she might like to paint the ceiling red. For now, it's dotted with glow-in-the dark rocket, star and alien stickers, an apt metaphor for Lauren's shoot-for-the-stars advice to other parents considering a similar project. "Just go for it," she said. "Gut check yourself that it's safe and structurally sound," she said. Then dive in. "There's very few things that aren't reversible." Inspiration from biggerthanthethreeofus.com and younghouselove.com: Free!